The Havasupai reservation was established in 1880, and was enlarged substantially in 1974. The reservation is composed primarily of the canyon lands on the south side of the Grand Canyon, and the plateau just south of that. Supai, the only village on the Havasupai Reservation, is in the canyons and accessible only by foot, horseback, or helicopter. It is an eight mile hike to get to Supai from the nearest road. "Our case is clear and undeniable. We are the people of the Grand Canyon. Our legends say the Havasupai were created on these lands of the Grand Canyon’s South Rim...prospectors were invading our area in the hopes of getting rich....Soon we were crowded from all our ancient lands, viewed as intruders.... We never agreed to the situation we find ourselves in..."
Today, about 430 people live in Supai. About a hundred children attend its day school, which they can attend through eighth grade. In 1974 uranium was discovered on the Havasupai Reservation. The tribe tried to stop the mining of uranium at its sacred site on Red Butte, but the Supreme Court ruled against the tribe and mining was permitted. Much of the Havasupai economy today is based on tourism. The Havasupai are descendents of the Hohokam culture. They were called the "people of the blue-green water." It is estimated that there were about 300 Havasupai in 1680. Their Yuman dialect has a lot in common with that spoken by the Hualapai and Yavapai peoples. The Havasupai once occupied the northern edge of the Tonto basin in central Arizona. 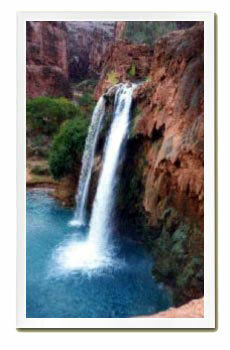 During the summer months the Havasupai farmed, ranched, and hunted on the plateau. 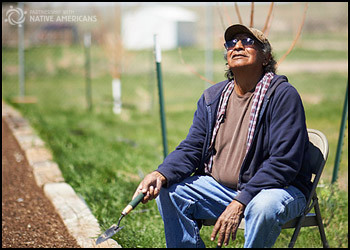 They moved into the canyons during the winter, where they grew corn, beans, and squash. They also mined red ocher, a form of much sought after ceremonial paint, for trade. The Havasupai always had friendly relations with the Hopi, and trade was common between the two tribes. Around 1840 miners and cattle ranchers moved into Havasupai territory. The tribe's economic system was destroyed as their hunting and grazing lands were taken. The Havasupai were polygamists; they could have as many wives as they could support. Betrothals were arranged by purchase and divorces granted only in the case of infidelity. The tribe was patriarchal; unusual for Southwest tribes. 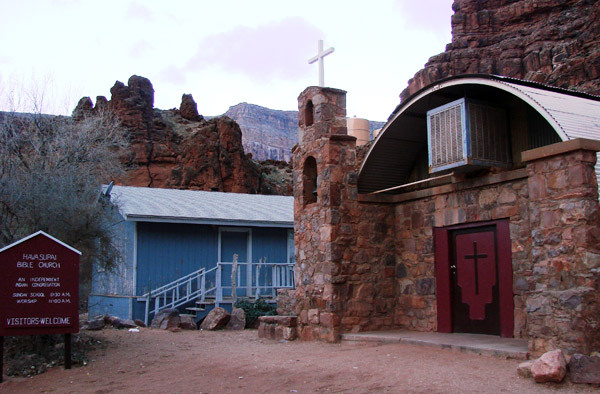 Extended families formed the basis of the Havasupai social and political culture. Each family acted as an independent economic unit and performed all the tasks required to survive. As many as ten families would form a regional band for mutual support. Each family in the band had similar status, but individual family members could demonstrate specific skills to increase his/her status. The Havasupai are the only one of the Yuman speaking tribes of the Hohokam culture that took on aspects of the Pueblo People.